In a bowl, combine all ingredients and stir well. 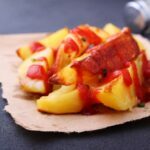 Use immediately, or for best flavor chill the ketchup (covered) in the refrigerator for 1 to 2 hours minimum prior to use to allow the flavors to meld. While Tabasco sauce and paprika are present in this recipe, the spiciness here comes mainly from horseradish. Control the heat by increasing/decreasing the amount of horseradish first.